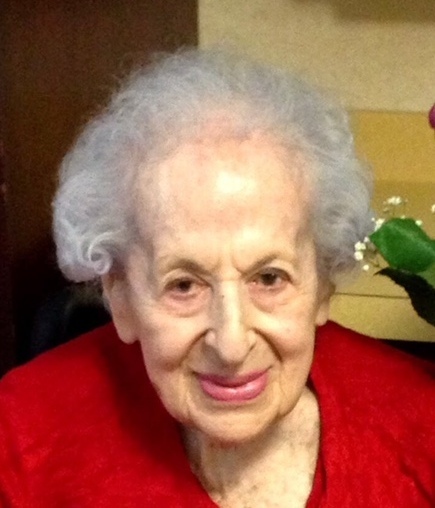 FRANCES GOLDSTONE, 100, of Jackson Twp., NJ, passed away on Saturday, October 6, 2018, at CareOne, Jackson Twp. She was born in Brooklyn, NY, and resided in Manhattan, NY, prior to settling in Jackson Twp., 7 years ago. Frances retired from Salant & Salant, New York City, where she worked in purchasing and logistics. She loved baking, children, dogs, reading, the New York Yankees, and the Arts, such as Broadway, Ballet and Museums. Frances knew everyone, often earning her the title of “Mayor”. She was predeceased by her great nephew, Gary Frank. Frances is survived by her niece, Ellen Vigeant, her great niece’s, Felicia Cappo, and Laurie Vigeant; her great nephew, Michael Cappo; and by her great-great nephew, Mason Cappo. Services are private at the convenience of the family. Arrangements are under the care of the GEORGE S. HASSLER FUNERAL HOME, 980 Bennetts Mills Rd., Jackson Twp., NJ. For further information and to send condolence messages to the family, please select a tab on the left.